How do we signal signalhood? That is, how do we know when others are trying to communicate with us? And what effect, if any, do such problems have on the development of novel communication systems? The Embodied Communication Game was developed to answer these questions, and results show not only that we are able to signal signalhood, even in highly restrictive circumstances, but also how interaction allows pairs of participants to develop novel, working communication systems. These findings suggest that an important prerequisite for the origins of human communication systems was the social-cognitive ability to make it apparent that a particular behaviour is communicative in nature, and to recognise the same. As I type, I am sitting in a coffee shop, with a newly refilled mug of coffee. I got the mug refilled not by doing it myself, nor by verbally asking my waitress. Instead, I caught her eye and tilted my cup in a particular, somewhat stylised way. This approach worked: the waitress understood my intentions, and came over to refill my cup. coffee cup could, in principle, have had any one of many possible meanings, and some philosophers have argued that it could mean literally anything at all. How do we determine what the actual intended meaning was? What cognitive capacities are involved? Much research in psycholinguistics and linguistic pragmatics is dedicated to addressing such questions. But there is another set of questions that we can ask which are, in some respects, more fundamental. In particular: How did the waitress even know that I wanted to communicate with her in the first place? How did she know that the tilt of my coffee cup was a signal of some sort? What did I do that indicated this? In short: How do we signal signalhood? After all, we frequently tilt our cups in an incidental way, with no intention to communicate anything by it: when chatting to friends for example. What makes this different? Eye contact surely plays some role, but that isn’t enough to explain it: sometimes I accidentally tilt my cup when I am idly daydreaming, and if I catch a waiter’s eye when doing so I would not expect him to refill my cup. There must be something in the way that I tilt it that reveals not only that I want more coffee, but also the very fact that I wanted to communicate with him at all. Examples like this are, of course, quite everyday. Signalling signalhood is easy, at least in face-to-face interactions, where cues such as eye gaze and body language often indicate an intention to communicate. But are these cues necessary, or just sufficient? Can we signal signalhood without them? To address such questions I designed the Embodied Communication Game (ECG), in which two players interact with one another only via a pair a networked computers (Scott-Phillips et al., 2009; see box). The key feature of the ECG is that, unlike other communication games (e.g. Galantucci, 2005), there is no a priori difference between communicative behaviour and any other particular behaviour. There is only behaviour in the (very simple) world of the game. Just as I had to find a way to indicate to the waitress that the tilt of my cup was no idle tilt, participants in the ECG have to find a way to indicate that some of their actions are communicative, while others are not. Even in the extremely restricted world of the ECG, in which the normal cues of an intention to communicate are absent, many participants were still able to signal signalhood, and subsequently develop efficient communication systems – and the forms of those developed systems showed clear vestiges of how the problem of signalhood was solved. However, experimental manipulations showed that signalling signalhood was far easier when participants had expectations of how others might behave; without those expectations, attempts often failed. My experiments with the ECG are part of a wave of exploratory studies that showed that it is possible to investigate the ways in which novel communication systems emerge and develop in pairs or groups of interacting individuals (Scott-Phillips & Kirby, 2010). This body of research has been termed ‘experimental semiotics’ (Galantucci, 2009), and, in addition to questions about signalhood, it has also investigated topics such as how writing systems can emerge (Garrod et al., 2007), which brain regions are used in communication (Noordzij et al., 2009), how groups develop and use accents and other hard-to-fake markers of identity (Roberts, 2010), and how communication systems evolve structural properties, particularly those seen in language (Kirby et al., 2008). There are potentially many interesting directions this research could take – but it is important that new studies have clearly defined research questions, and are not simply excited but directionless extensions of this early body of work. As may be apparent, much of this research is motivated by inquiry into the origins of language, and is consequently concerned with how communication systems evolve from simple states to the rich, structured entities with which we are familiar. Yet experimental semiotics necessarily use participants that have many years’ experience with such systems, and indeed are biologically disposed to use them in particular ways, and so it is difficult to draw direct conclusions about how language might have evolved. However, the agenda here is more subtle than a naive attempt to recreate the origins of language in the laboratory. Instead, the (often implicit) goal is to uncover general principles about the development of communication systems, for example how cultural transmission can lead to well-designed systems, and the role that cognition plays in such processes (Scott-Phillips & Kirby, 2010). In the coming years we will see whether experimental semiotics delivers on this promise, and hence develops into an established approach in the interdisciplinary area between psycholinguistics, cognitive science, and experimental pragmatics. Although it does speak to these general concerns, the main implications of my research with the ECG come from a comparison with the origins of animal signals. Signals and responses depend upon one another to explain their adaptive value: there is no value in signalling if there will be no response, and there is no value in having mechanisms for responding if the signal never comes. This means that the evolution of communication poses something of a chicken-and-egg problem. The commonsense solution is that one or the other evolves first for reasons independent of communication, and this then provides the selection pressure for the other half to evolve. Consequently, most animal signals (with the possible exception of great ape gestural communication) have relatively fixed meanings, to which they are tied because of their evolutionary history. What the ECG shows is that humans are able to bypass the chicken-and-egg problem (Scott-Phillips et al., 2012), and this opens the floodgates to a world of rich creativity in signal use, of which language is the most salient example. The reason we can do this is that we possess a suite of species-unique social cognitive traits for intentional communication (Tomasello, 2008). Among other things, these traits allow us to make it apparent to others that we wish to communicate with them, and we can do this in a range of innovative ways – like tilting our cup. The origins of the expressive flexibility of human communication lie in our ability to do this. The Embodied Communication Game (ECG) is an interactive, two-player game in which the participants collaborate to score as many points as possible. 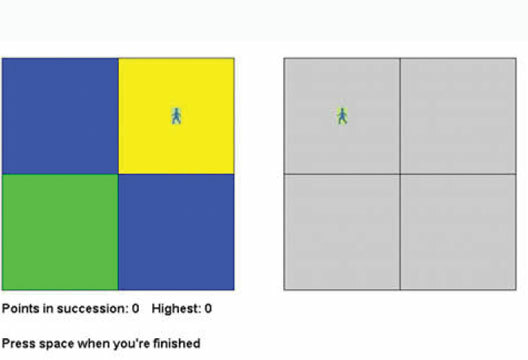 Each player controls a stick man, who moves around his own 2x2 box (figure 1). Each of the four quadrants of the box is coloured either red, blue, green or yellow, at random. Each player sees both boxes, and the movements within them, but can see only the colours of their own box. The players can move between quadrants at will, but each move is from the centre of each quadrant to the centre of the other quadrants, so they are unable to trace out letters or other symbols with their movements. Once both players have ?nished, the colours of all quadrants are revealed to both players. If they have ?nished on identically coloured quadrants they score a point. The participants’ goal is to score as many points in succession as possible, within the 40 minutes they are given to play the game. To do this, they must use certain movements, or combinations of movements, to refer to their intended destination – although the instructions they received did not mention communication at all; instead, they simply said that participants should attempt to ‘coordinate’ their behaviour with the other player. The challenge, then, is to make it apparent to one’s partner which movements are communicative, and which are simply used to travel around the box. What happens? Communication systems develop. First, the players converge upon a default colour, which they always choose if it is available. While this (non-communicative) strategy is better than chance, it fails when one player or the other has no quadrants of this default colour. However, it does provides expectations of how the other player will behave – by heading directly to one of the quadrants. So when a participant does not have the default colour, they are able to indicate this by deviating from this expectation, typically in a patterned ways (e.g. oscillations along one side of the box, or repeatedly going all the way around the box). Participants then choose another default colour to use when the initial default is unavailable. In debrief interviews participants consistently reported that these deviations initially ‘meant’ ‘Not plan A!’ or something similar, but over time they became associated with the second default colour. Once this convention was in place, they found it easy to negotiate on signals for the two remaining colours. Subsequent experimental manipulations confirmed the importance of the expectations of the other player’s behaviour that the default colour provides; without it, attempts to signal signalhood are far less likely to be recognised as such. Galantucci, B. (2005). An experimental study of the emergence of human communication systems. Cognitive Science, 29, 737–767. Galantucci, B. (2009). Experimental semiotics. Topics in Cognitive Science, 1, 393–410. Garrod, S., Fay, N., Lee, J. et al. (2007). Foundations of representation: Where might graphical symbol systems come from? Cognitive Science 31, 961–987. Kirby, S., Cornish, H. & Smith, K. (2008). Cumulative cultural evolution in the laboratory. Proceedings of the National Academy of Sciences, 105(31), 10681–10686. Noordzij, M.L., Newman-Norlund, S.E., de Ruiter, J.P. et al. (2009). Brain mechanisms underlying human communication. Frontiers in Human Neuroscience, 3, 1–13. Roberts, G. (2010). An experimental study of social selection and frequency of interaction in linguistic diversity. Interaction Studies, 11, 138–159. Scott-Phillips, T.C., Blythe, R.A., Gardner, A. & West, S.A. (2012). How do communication systems emerge? Proceedings of the Royal Society of London, Series B, 279, 1943–1949. Scott-Phillips, T.C. & Kirby, S. (2010). Language evolution in the laboratory. Trends in Cognitive Sciences, 14(9), 411–417. Scott-Phillips, T.C., Kirby, S. & Ritchie, G.R.S. (2009) Signalling signalhood and the emergence of communication. Cognition, 113, 226–233. Tomasello, M. (2008). The origins of human communication. Cambridge, MA: MIT Press.